A torch during tonight’s night garden walk in the rain revealed soggy flowers from Japanese Anemones and Astrantia - their white, pink and deep red flowers are fading with each day just now. Osteospermum ‘Stardust’, the hardy geranium ‘Rozanne’ and Gentiana sino-ornata all had one folded flower nodding as if asleep in the rain. The level of the wildlife pond has swollen with the heavy rainfall of late. Heuchera ‘Marmalade’ is trying to flower around its edge. Almost black berries from Ophiopogon planiscapus 'Nigrescens' are nearby. Deep purple berries on the recent planting of Liriope muscari 'Royal Purple' are shrivelling away. At the same time the intense red berries on two small Cotoneaster trees are proving too tempting a treat for Blackbirds and Woodpigeons – how long will they last? Meconopsis and White Campion not flowering in my garden today. Odd white flowers are like tiny bright lights in the night garden. An upright variety of Campanula hides in a sheltered corner away from the winds, a Jasmine scrambles up through a trellis and Bacopa 'Snowflake' tumbles down from a container. Out in the open, flat caps of pink Sedum flowers are fading fast - no butterflies or bees will feed from them now. Holding on a bit better, this dark November Garden Blogger’s Bloom Day, are the flowers of Lavender, Erysimum 'Bowles' Mauve, Hardy Fushia ‘Mrs W P Wood' and Field Scabious. Catching the rays of light from tonight’s torch were the tiny, pretty pink flowers of the heather ‘Peter Sparkes’ (planted to attract Bullfinches). The star of tonight’s night garden stood tall in almost defiance of the rain and wind. Not your typical GBBD flower style either. The two flower spikes of a Gunnera looked in perfect condition and in complete contrast to their wilting, soggy leaves falling to the ground around them – a strangely surreal sight tonight. 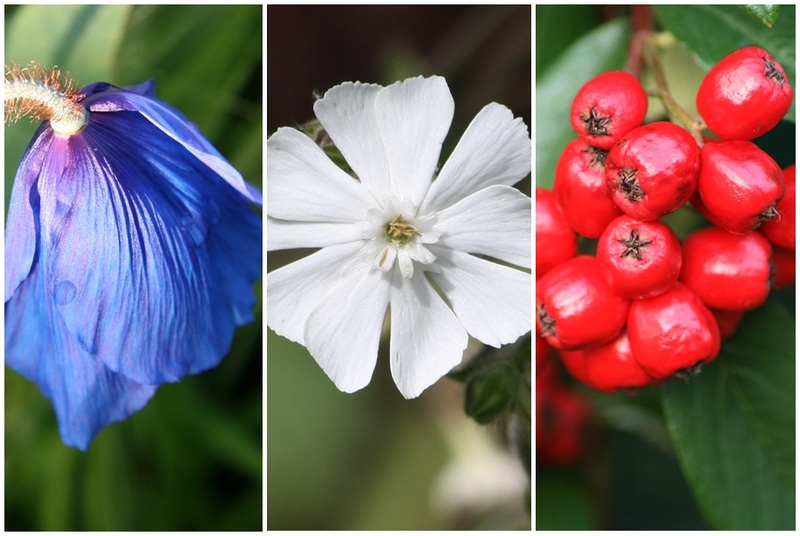 This post was published by Shirley for shirls gardenwatch in November 2015. It is easy to tell why the plants that need moths to pollinate the flowers have white flowers isn't it? I quite enjoy going out and taking photographs at nightmare with the flash you get a really different effect. You are lucky to have anything to photograph considering the weather of late. You can get some interesting pictures at night with or without the flash. Your night patrol sounds not only fun Shirl but also a chance to focus on plants from a different angle. That meconopsis is such a glorious shade. I have a severe case of I wantitisis.